My favorite new pillows! I'm a side sleeper, and these keep my neck well-supported. 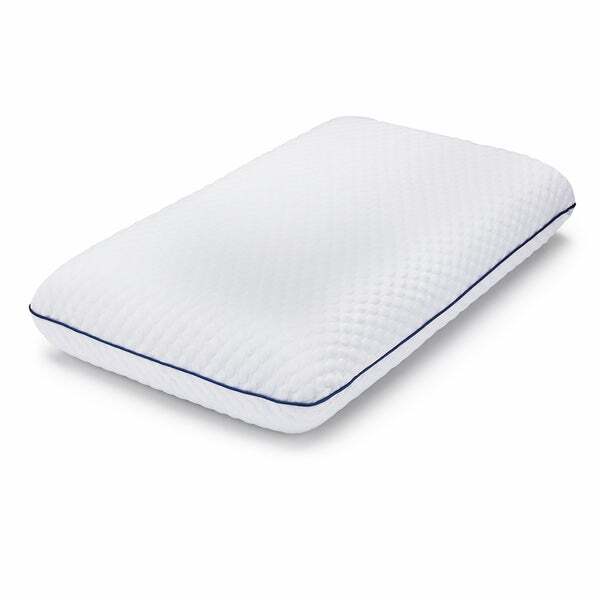 This gel memory foam pillow from Weekender offers pressure relief for restful sleep. Gel memory foam contours to curves and distributes weight evenly to enhance sleep comfort. Pillow is ventilated to increase air circulation. The cover can be removed and machine washed for a pillow that always looks and feels new. I received this pillow as part of a free trial. It’s extra soft, more of a flat conforming pillow than a firm shape holding type. It reshapes automatically which I find nice as someone that changes positions a lot while sleeping. I really like the feel of the removable cover that comes on the pillow! I just tried this pillow last night and I am obsessed with it. My apartment doesn't have AC in it and the past few weeks have been miserable at night because its just soo hot! This pillow is so cool and I didn't have to flip it over constantly throughout the night to lay on the "cool side". It is the perfect amount of firm and soft. I slept like a baby and didn't wake up with any crooks in my neck or weird shoulder pain that I sometimes will with other pillows. I will definitely be adding more of these to my bed! ** I did receive this product for free in exchange for an honest review. I've been using it for a few days now and lemme tell ya, this pillow is so comfortable. Soft but structured, cool but not cold, I love it all. And all for a great price too. I'm a big fan of their products and am going to keep looking for more after this great purchase. This pillow is amazing!! It does smell bad when you first get it, but airs out. It has been perfect for traveling this last week. It is squishy, soft, and light. This pillow was amazing. I've always hated how hot my pillows get at night, but this pillow really helps me stay cool. I'll never go back to my old pillows. This pillow is the perfect combination of soft and firm. I love that is comes with a nice cover that can be removed for washing. The pillow stays cool when sleeping at night. This is a great pillow! Fantastic memory foam pillow. It is super soft and my head really sinks into the pillow and conforms when I lay down. There's definitely a smell whem you first open the pillow, but it fades pretty quickly. Overall I'm pleased with this pillow and think it's exceptional for the price I paid. I had previously bought other ones that were hard and I woke up with a sniffed neck. But this is by far the best memory foam pillow. Totally recommend this one. I love that it isn't heavy. I haven’t been a fan of foam pillows. I bought these pillows to use on my bench to sit on but am thinking I may have to try them for sleeping on first! This is the most comfortable pillow and i find that i do not wake up all sweaty since i started using it. It does stay cool and molds well to my head. I did not expect to like these but they plumped up to just the right size. They barely smell at all after a couple of hours but I put them in a pillow cover anyway. They felt just right and I am very pleased with them! Great foam pillow. Aired it out for 2 days and viola...it was ready for sleepytime! This baby is sinkable softness that was so comfortable I couldn't last 15 min without falling to sleep. Just the right amount of give. Worth every penny I paid! I love this pillow - soft but supportive. I have always slept with multiple pillows to get the support I need but now I only need this pillow. It is dream and I hope it holds up. Bought these for my daughter to take to summer camp, and she loved them. These pillows are amazing! The pillow has just the right amount of give, yet somehow provides perfect support, too. The pillows stay cool throughout the night and I haven't needed to turn them over to the cool side. Idon't know how they did it, but I am so glad because now I sleep like a baby! I have told ALL my friends and family members to purchase these pillows. You should, too. Take it from this former insomniac. You won't regret it. Seems to be helping my neck position while sleeping. Keep waking up with headaches and neck aches. Will give it some more time. "what are the dimensions of this pillow please...a lot of reviews of memory foam pillows say they're smaller, not the usual standard sizing. Thank you, Suzanne"
The dimensions for the pillow are 16"x24"x5". Looking for a good pillow. Read reviews looks like what I'm looking for.